Last April, we conducted our SSEAYP International Philippines (SIP) general assembly meeting at the Museum of Art of GSIS in Pasay City. It was held there because one of the staff members of the museum is a member of the alumni organization. I was able to go around the museum after the meeting. At long last, I have seen this masterpiece, the Parisian Life. I have been hearing this painting long ago which became so controversial because it was bought by GSIS in Hong Kong for 46 million pesos in 2002 and now after ten years it is valued at five times the buying price. 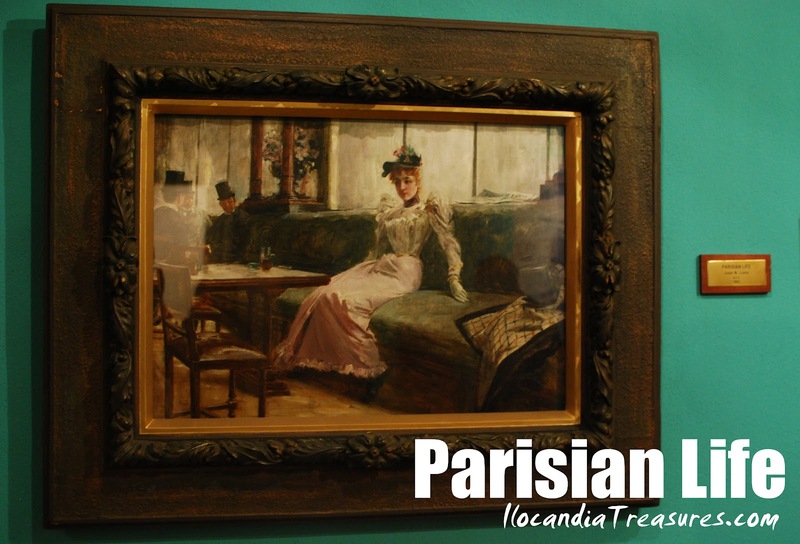 Parisian Life is a masterpiece created by Juan Luna in 1892. This great Filipino painter was born in Badoc, Ilocos Norte and later moved to Manila where he studied at Ateneo Municipal de Manila where he earned his Bachelor of Arts. Juan excelled in painting and drawing as he was influenced by his brother Manuel Luna. He won the gold medal in the 1884 Madrid Exposition of Fine Arts together with Felix Hidalgo who won silver medal citing their win as evidence that Filipinos and Spanish were equal. I have seen the artwork up close. It measures 44 inches by 39 inches. It is framed in glass. We were given a lecture with regards to its interpretations. 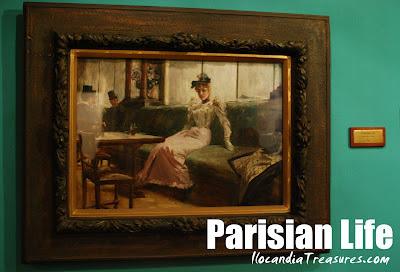 The painting shows that there are three men in the background who were named as Dr. Jose Rizal, Dr. Ariston Bautista Lin and Juan Luna himself. In foreground meanwhile is a French woman. The first interpretation of the artpiece is that in a café, while busy talking issues about their homeland, three Filipinos’ attention was caught by this woman considered as a prostitute. The second theory that our lecturer shared to us was that Luna was having family problems. There was the death of his infant daughter and he had suspicion that his wife was having an affair with another man. The woman in the artwork represents his wife. Looking at it, there was this half-empty beer mug placed in the table in front of the woman and the coat near her belongs to the man. And the third interpretation was that the woman depicted to represent the Philippines as she forms the shape of the country in juxtaposition. It symbolizes the state of the country at that time.